In science there are instances when a specific mechanism is understood and a hypothesis posed based on an understanding of the processes involved, prior to the initiation or observation of the those processes. An excellent example is the determination by Molina and Rowland (1974) that CFC’s will lead to losses in stratospheric ozone. The full truth of their understanding of the process was not revealed until the Antarctic ozone hole was reported in 1985 by Farman et al. A different example, from the same time period, was the 1978 publication by the late John Mercer, Ohio State U., who argued that a major deglaciation of the West Antarctic Ice Sheet (WAIS) may be in progress within 50 years. 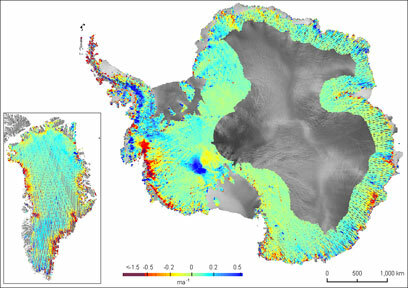 This conclusion was based on the fact that the WAIS margin was ringed with stabilizing ice shelves, and that much of the ice sheet is grounded below sea level. The loss of ice shelves — Mercer proposed — would allow the ice sheet to thin, grounding lines to retreat and the ice sheet to disintegrate via calving. This is a much faster means of losing mass than melting in place. Mercer further commented that the loss of ice shelves on the Antarctic Peninsula, as has since been observed, would be an indicator that this process of ice sheet loss due to global warming was underway. Mercer’s ideas led Terry Hughes (1981) (my doctoral advisor at U. of Maine) to propose that the WAIS had a “weak underbelly” in Pine Island Bay. This bay in the Amundsen Sea is where the Pine Island Glacier (PIG) and Thwaites Glacier reach the sea. These are the only two significant outlet glaciers draining the north side of the WAIS. Together they drain 20% of the WAIS. Hughes called this area the “weak underbelly” because these glaciers lack the really huge ice shelves Ross Ice Shelf and the Ronne-Filchner Ice Shelf in which most other large WAIS outlet glaciers terminate. Both glaciers have a relatively rapid flow from the WAIS interior to the calving margin. Further the low surface slopes and smooth flow patterns of PIG suggested to Hughes that there was no indication of a landward rise in the elevation of the glacier bed; such a rise would help stabilize the glacier. Without a rise in the bed, glacier thinning and retreat could result in continual grounding line retreat. The grounding line is where the bottom of the glacier comes in contact with the ground below the ice sheet, in this case the sea bottom. The grounding line is an anchoring point for the outlet glaciers. The length of the glacier that is grounded is both slowed and stabilized by resulting basal friction. Beyond the grounding line toward the margin, the floating ice shelf is susceptible to rapid calving retreat and as the grounding line retreats, so would the calving front. Note in the image below that the situation is even less stable than Hughes speculated. The current grounding line is at a higher elevation than the bed of the glacier for the next 200 km inland of this grounding line. (Note, inland is to the left in the figure, below.) The deeper the basin, the thicker the ice must be to maintain grounding. This makes it tough to slow grounding line retreat once it begins in a deepening basin. The weak underbelly idea was forgotten for some time. While I was attending a conference on rapid glacier flow in Vancouver BC in 1986, data were presented that showed no acceleration of Pine Island Glacier. This was further noted for the entire 1970’s to early 1990’s period by Lucchita and others (1995). Then, in 1998, Rignot (1998) used satellite imagery to identify that the grounding line of Pine Island Glacier had retreated 5 km from 1992 to 1996. In the same year, Wingham and others (1998) observed a 10 cm per year thinning in the drainage basins for Thwaites and PIG during the 1990’s. Shepherd and others (2001) noted thinning in the fast flow areas of the glacier of 1.6 m/year between 1992 and 1999. This led them to conclude that the observed inland thinning and acceleration of PIG was a response to enhanced glacier bed lubrication. Not from surface melting of course as there is next to none on this glacier. Rignot and others (2002) noted that the glacier had accelerated 18% over a 150 km long section of the glacier in the fast flow area between 1992 and 2000. Change was afoot: after 50 years of apparent stability, the glacier calving front was retreating, and the grounding line was retreating indicating reduced bedrock anchoring. The reduction in basal friction would then lead to faster flow and more thinning. Was this just a short-term increase? In 2006 and 2007, instruments were placed directly on PIG for the first time by the British Antarctic Survey. Four GPS receivers monitored ice flow from 55 to 171 km inland of the calving front at the center of the glacier (Scott and others, 2009). Glacier velocities had been noted at each site in 1996; by 2007 the respective increase in velocity was 42%, 36%, 34% and 26% respectively, an approximately 2 to 3% annual increase. The increase from 2006 to 2007 was 6.4% at 55 km from the terminus and 4.1% at 171 km inland. The extent of the fast flowing portion of PIG is seen in the figure below. 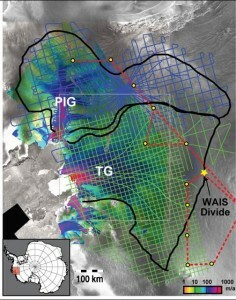 A separate data set, radar based was used by Rignot (2008) to identify a 42% acceleration of PIG between 1996 and 2007 accompanied by most of its ice plain becoming ungrounded. 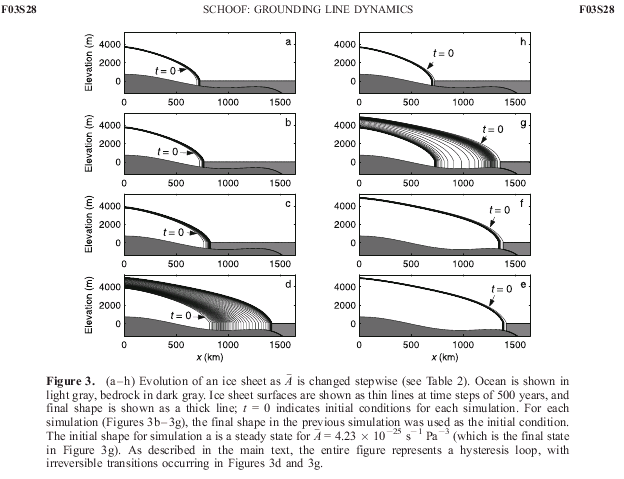 Scott and others (2009) pointed out that the greater thinning toward the grounding line and terminus increased the surface slope and the gravitational driving stress, further promoting acceleration. Then Wingham and others (2009) reported that the 5400 km2 central trunk of the glacier had experienced a quadrupling in the average rate of volume loss quadrupled from 2.6 km3 a year in 1995 to 10.1 km3 a year in 2006. PIG had an annual volume flux at the front of 28 km3 a year, so this increase is a marked change. Their observations were that the region of lightly grounded ice at the glacier terminus is extending upstream, and the changes inland are consistent with the effects of a prolonged disturbance to the ice flow, such as the effects of ocean-driven melting. 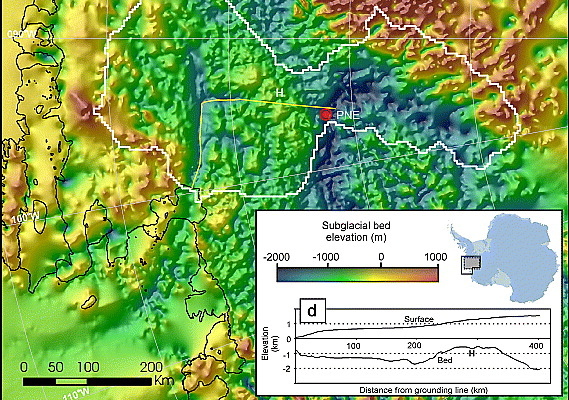 Further examination of the bed topography by Vaughan and others (2006) indicates that most of the bed of the drainage basin of PIG is more than 500 meters below sea level, and there is a particularly deep basin in the eastern section of the upper basin. The observed acceleration, retreat of the grounding line, thinning of the lower section of the glacier and the observed elevation of the basal topography provide no indication that this is not a weak underbelly of WAIS. Basal topography of Pine Island Glacier region (from Vaughan et al, 2006). Bindschadler, R.A., History of lower Pine Island Glacier, West Antarctica, from Landsat imagery, Journal of Glaciology, 48 (163), 536-544, 2002. Farman, J., B. G. Gardiner and J. D. Shanklin, (1985). Large losses of ozone in Antarctica reveal seasonal ClOx/NOx interaction, Nature, 315, 207-210. Hughes T. (1981). “The weak underbelly of the West Antarctic Ice Sheet”. Journal of Glaciology 27: 518-525. Luchitta, B., Rosanova, C., and Mullins, K. (1995). Velocities of Pine Island Glacier, West Antarctica. Annals of Glaciology, 21, 277-283. Molina, M.J. and F. S. Rowland (1974). Stratospheric sink for chlorofluoromethanes: Chlorine atom-catalysed destruction of ozone, Nature, 249, 810-812. Rignot E (2008). “Changes in West Antarctic ice stream dynamics observed with ALOS PALSAR data”. Geophys. Res. Lett. 35: L12505. doi:10.1029/2008GL033365. Rignot, E.J. (1998). Fast recession of a West Antarctic Glacier, Science, 281, 549-551. Rignot, E.J., D.G. Vaughan, M. Schmeltz, T. Dupont, and D.R. MacAyeal (2002). Acceleration of Pine Island and Thwaites Glacier, West Antarctica, Annals of Glaciology, 34, 189-194. Scott J.B.T., Gudmundsson G.H., Smith A.M., Bingham R.G., Pritchard H.D., Vaughan D.G. (2009). “Increased rate of acceleration on Pine Island Glacier strongly coupled to changes in gravitational driving stress”. The Cryosphere 3: 125-131. http://www.the-cryosphere.net/3/125/2009/tc-3-125-2009.html. Shepherd A., Wingham D.J., Mansley J.A.D., Corr H.F.J. (2001). “Inland thinning of Pine Island Glacier, West Antarctica”. Science 291: 862-864. doi:10.1126/science.291.5505.862. Vaughan D.G., Corr H.F.J., Ferraccioli F., Frearson N., O’Hare A., Mach D., Holt J.W., Blankenship, D.D., Morse, D.L., Young, D.A. (2006). “New boundary conditions for the West Antarctic ice sheet: Subglacial topography beneath Pine Island Glacier”. Geophysical Research Letters 33: L09501. doi:10.1029/2005GL025588. Wingham D.J., Wallis D.W., Shepherd A. (2009). “The spatial and temporal evolution of Pine Island Glacier thinning, 1995 – 2006”. Geophysical Research Letters 36. doi:10.1029/2009GL039126. Sorry, this is completely off topic, but I think that someone here needs to address PaulHudson’s latest blog at the BBC. See http://www.bbc.co.uk/blogs/paulhudson/. Anyhow, people in the know really need to comment on Paul’s blog (which seems to be based on the work by Knight et al. (2009)) and to also present a balanced opinion. Maybe RC could also have a thread on this very topic? Mauri Pelto — Most clear, but what are “H” and “PNE” marking the final map, entitled “Basal topography of Pine Island Glacier region”? Thanks Eric– still, would not hurt for someone in the know to post some comments on the BBC site. Hi, there has been some mention of volcanic activity in the Antarctic potentially affecting the ice. This article doesn’t mention volcanoes – does this mean that that Antarctic volcanic heat production has been studied and found to be negligible, or is there a lack of data ? I haven’t been able to find much on this on the web, apart from references to Corr’s paper. H refers to the basal high that is separating the northern and southern portion of the glacier. PNE refers to the base camp used by the British Antarctic Survey and University of Texas. So the jury is still out, but signs at present seem rather ominous? What are those “acceleration” numbers? Did they report that an individual sensor accelerated with time (and its changing location) — the dynamics completely believable without any “collapsing ice shield” theory. Or, they bury new instrument at the same location and that new instrument is moving faster than the predecessor? Am I correct in thinking that we still don’t know the spatial pattern of volcanic heat production in the Antarctic? According to Corr’s paper, HMSV is contributing to melting at Pine Island Glacier – I think this fact should at least be mentioned in the article. Is a grounding line defined as connected to the ocean? What happens when an under ice lake breaches a connection to the sea – no matter how slightly – does that immediately extend the grounding line as the lake boundary? If the ratio of above sea level ice to below sea level floating ice is roughly 9/10 — then with ice resting on ground that is 2000 meters below sea level, isn’t there a set ice altitude above sea level where the ice becomes unstable (200 meters above sea level?) – whether or not it is floating? Are there measured areas where the ice surface altitude is less than this ratio? Are these areas of increased instability? Such an interesting and complex system to investigate. #2 I have had a go too – there will be a flood of the “even the BBC thinks global warming is over” posts before you can say “nevertheless, the Arctic melts”. Could someone define the term “trunk” for those of us who are too lazy to use the Google? I can see from the diagram that it lies between the interior and the shelf, but what distinguishes it from those sections, and what is the point labelled “E” (I can guess that “GL” is the grounding line)? I wonder what effect Vulcanism might have on this Glacier; I think it was one of those noted (1980’s? 1990’s?) in a SciAm Item for the fact that a series of under-the-icesheet Volcanoes were causing the emmisions of large quantities of water from under the edge of the glaciers, where they meet the sea, and the fact that these eruptions were causing rapid advances in the sheets march toward the sea. Is there any data on the temperature of the water in the embayment where the ice calves? Has it changed temperature in the last 50 years? Is data available on the local currents and their rate of flow and temperature? If the ice upstream from the calving front warms from whatever it was does that affect the flow rate of the glacier? Are there any temperatures where the deformation rate of the ice changes rapidly? Has the temperature of the glacier ice changed? Why can’t the Ross ice shelf start to melt faster? Is it considered to be so massive that it is resistant to change? After all, it is already afloat, a change in currents to bring warm water to the base would start to melt it right away. That’s not correct; Eric answered you the first time you asked, inline: 9 November 2009, 4:01 PM, quoting the paper. Did you read somewhere that it “is contributing”? Useful to know where you got the idea if you remember your source. WOW! Not the scenery. I mean what you are saying if I am reading you right. I mean, “Goodby Florida.” I hadn’t thought of glaciers calving almost all the way around Antarctica. Nor had I thought of the rock topography as being that rough. The glaciers haven’t made the bedrock smooth and level. Ice must be more fluid than it seems. I see the distance scale is 100 kilometers, but still… More graphics please. Very impressive. Keep up the good work. Could you give us a virtual tour? I am unclear as to where the line is thru the topography. #11 The acceleration reported is for specific sensors on the glacier in the case of the GPS surveys, or specific features in an area of the glacier in the case of the radar. The grounding line is where the ice stream become afloat, so if a subglacial lake breaches to the ocean, unless it is deep for the ice stream to become floating, it will not alter the grounding line in and of itself. You will note that the depth in the basin shortly upstream of the grounding line is mostly 1200 meters or more below sea level. This requires over 1300 m of ice thickness to support, with a surface elevation exceeding 120 m, as you suggest. The surface altitude is well mapped using altimetry data. #10 The thinning and acceleration of PIG are propagating from the terminus-grounding line area inland. This suggests the origin of the acceleration is in this area. The acceleration and thinning do not match the pattern I would expect from sub volcanic activity. This is why the issue was not discussed. It does not seem to fit the dynamics of what we are observing on all three glaciers in the area exiting into the Amundsen Sea. #9 Hank Roberts good links as usual. It was not appropriate in the original post to add too many links to the Youtube’s that highlight Bindshadler’s work last year or ice bridge this year. I knew they would come. #15 we do not have long term measurements of either the temperature of the water in Pine Island Bay or of the ice itself, so we cannot address this issues as yet. The Ross Ice Shelf is not resistant to melting from beneath. I did work on bathymetry map for PIG in 1985 and at the time it did not appear there was any shoaling to water restrict ocean water movement under the ice shelf. I am not familiar with the constraints to inflow under the Ross ice Sheet, to date it has not been observed that basal melting has increased significantly. Hank Roberts, my mistake, I should have said “may be contributing”, as per the Corr paper, “high geothermal heat flux … may be delivering subglacial water to Pine Island Glacier”. So what is the current heat input from Antarctic volcanoes ? Do we know? My question about it wasn’t answered by Eric, who merely mentioned that the matter has been considered. It’s not clear to me whether he was referring to the topographical explanation given in Corr for the contained localised effect of HMSV, or if he was referring to other research that exists measuring the subglacial temperature anomalies in the Antarctic caused by volcanic activity. #18 thank you for the explanation. Is it not possible that sub-glacial melting from volcanically heated water could melt and lubricate the marine portion of the trunk, facilitating the movement from gravity, and also maybe causing the thinning on-land, where friction is greater and movement slower ? Ice sheet thinning in Antarctica and Greenland. Red areas indicate regions of strongest thinning. Thank you for this excellent assessment. This is my first experience posting to RealClimate, however I felt compelled to comment. It seems to me that the foundational intuitions and observations made by the late John Mercer and Terry Hughes often go unrecognized. This is particularly evident in the recent literature pertaining to the problems of West Antarctic Ice Sheet instability and even the general concept of mechanical ice-sheet instability. However NSF-funded Antarctic glaciological research continues today largely thanks to the hard work and forward thinking of those two individuals three decades ago. Thank you for recognizing the pioneering work of Mercer and Hughes. As long as people are bringing up the issue of subglacial volcanism there have been some papers purporting that rapid deglaciation can trigger volcanic eruptions. This is of course the inverse of the usual suspects trying to explain away rapid deglaciation by saying “maybe there’s a volcanoe we can’t see”. I don’t have any of the references, but some handwaving theory is convincing enough to motivate further study. Essentially, a simplistic model of volcanism would have magma slowly rising within the crust. When it reaches a shallow enough depth that the confining pressure is too little to contain the volatiles, they start to come out of solution. Presumably an eruption follows soon afterwards. Now add rapidly a rapidly thinning ice sheet, and the rate that contours of hydrostatic pressure would descend could easily exceed the rate of magma rise by severalfold. The result (if this simple theory has any explanatory value) would be that during periods of rapid deglaciation local volvanic activity might increase severalfold. Presumably during ice sheet formation local volcanism would be suppressed by the same mechanism. I think this might make an interesting subject for a future post. If indeed this is a real effect, how much increased volcanism might we expect? Iceland is an obvious example. But what about the common snow covered volcanic peaks? Is there enough ice, and is the snowline likely to rise fast enough for the rate of iceloss to significantly decrease the pressure on underground magma? downstream thinning will cause further ungrounding and acceleration. This would suggest to me that the glacier grounding line will retreat into the deeper basin upglacier of the current grounding line. The cause of the thinning, which then leads to the acceleration is the focus of some of the sub ice shelf studies. Bob Bindshadler of NASA suspects that there is likely about fifty meters per year of basal ice being melted at the grounding line. Thomas, #25–this is interesting to me because I’m looking at Ekholm’s 1901 synoptic paper on “carbonic acid” and climate. Part of his view of the recurring ice ages involved an oscillating feedback cycle in which silicate weathering and biological uptake/sedimentary deposition draw down CO2, cooling the globe; this cooling would cause the Earth’s crust to contract by a calculated amount of several kilometers (distributed around the globe), inducing intensified vulcanism, which, prolonged over many millenia, would then raise CO2 levels and hence temperature, starting the cycle over again. Ekholm also discusses the orbital obliquity cycle and its influence, presenting some interesting calculations a la his buddy Arrhenius, but he sees it as secondary to CO2/temperature feedbacks. The survival of the Antarctic ice shelves including these is dependent on the temperature and salinity of the subsurface ocean water. Warmer or saltier ocean currents could melt WAIS ice from the bottom up regardless of specific local bottom topography. I suggest that this excellent summary should be put in the context of trends in subsurface ocean currents. Has anyone see warmer water in the southern oceans? Re #16: I was in Pine Island Bay in March 2006 on a Polar Stern cruise, and maximum water temperatures in the bottom layer were around 1.1 °C. I was doing biology, but colleagues were deploying moorings to get a better picture of the annual temperature/salinity cycle. Don’t know whether they’ve published it yet, though. Novice question here, but I’m running the plasticity of ice, the higher density of sea water, and the lower melting point of salt water through my head and I’m wondering what keeps sea water from knifing under the ice and rushing downhill into the basin. I imagine the mechanics would be similar to those that allow meltwater above a certain depth to cut a channel clear to the bottom of a glacier. Or rather, presuming the weight of the ice on top and the limited deformation of the ice itself where it meets the terrain forms a seal at the grounding line, is there a simple ratio, something like / that would serve as a rule-of-thumb as to where the ground line is stable? Actually, I guess you could look and where ice shelves meet ice sheets and if there is some, relatively consistent, ratio like above for where these lines occur. If the slope inland is positive, then there is no increase-in-pressure-with-depth mechanism and the line is stable where the ratio is 10 to 9. However, if the slope inland is negative, and if the upslope of ice sheet is less than the downslope of the bottom terrain, and the difference causes the ratio line to be crossed, doesn’t the sea water rush in? This could happen as the grounding line moves into a steeper downslope area or the outflow of the glacier lowers the height above, or both. I think I’m asking the same question as #11. Kind of wondering if we might be in for some major geologic event, like the filling of the Mediterranean, or the North American glacial damn burst events. Hoping someone will respond if I’ve managed to produce an interesting question. Readers may be interested in the genesis of the phrase, “the weak underbelly of the West Antarctic Ice Sheet.” Here it is. In the 1980s George Denton and I were charged with reconstructing past ice sheets for CLIMAP (Climate: Long-range Investigation, Mapping, and Prediction, a project of the 1970-1980 International Decade of Ocean Exploration). As a glacial geologist, George was responsible for the areal extent of these ice sheets and, as a glaciologist, I was responsible for their vertical extent. There were two CLIMAP experiments to reconstruct past climates, one at the Last Glacial Maximum (LGM) 18,000 years ago when sea level was about 120 meters lower than today, and one at the Last Interglacial Maximum (LIM) 125,000 years ago when sea level was about 6 meters higher than today. John Mercer, in 1968 and 1970, called attention to the fact that the West Antarctic Ice Sheet (WAIS) was grounded mostly below sea level, calling it a “marine ice sheet” that was therefore inherently unstable, and proposed that the higher sea level resulted from its LIM collapse 125,000 years ago. George and I determined to model that collapse for the CLIMAP experiment at the LIM. Along with David Schilling, I had developed a model to reconstruct former ice sheets with ice elevations based on the strength of ice-bed coupling determined by glacial geology. Uncoupling was most complete along liner troughs that I concluded had been occupied by ice streams, fast currents of ice that drain most of the interior ice from ice sheets past and present. Present ice streams draining the Greenland and Antarctic ice sheets have characteristic concave surface profiles produced when slow interior sheet flow is downdrawn by fast stream flow near ice-sheet margins. I reduced ice-bed coupling along ice streams to generate these profiles. For the LIM experiment, we enlisted James Fastook to incorporate the marine instability mechanism published by Robert Thomas in 1977 to make grounded ice margins retreat when ice downdrawn by ice streams became thin enough to become afloat along the WAIS marine margins. 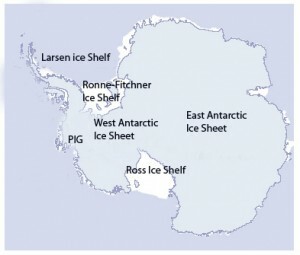 Large floating ice shelves had formed in the Ross Sea and Weddell Sea marine embayments after WAIS had collapsed in those sectors after the LGM, and I had concluded that these ice shelves, being confined and pinned at places to the sea floor, were now buttressing these sectors of WAIS, preventing further collapse. However, upon inspecting the large map of Antarctica published by the American Geographical Society in 1970, George Denton and I noticed that one-third of the remaining WAIS were drained by two large ice streams that entered Pine Island Bay, an ice-free embayment in the Amundsen Sea sector. We decided to run our model for the CLIMAP LIM experiment without allowing an ice shelf to form as the grounding line retreated and enlarged Pine Island Bay. Sure enough, the remaining WAIS collapsed. This collapse scenario was published in the Antarctic chapter of The Last Great Ice Sheets (LGIS) published by Wiley-Interscience in 1981, a book we edited that presented our CLIMAP work. invasion there. In World War I, however, that strategy had been tried by the British with disasterous results at Gallipoli (using Aussies and Kiwis as cannon fodder), and the American/British march up the Italian boot was our longest and bloodiest campaign during World War II. The underbelly wasn’t so soft. Likewise, the Amundsen sea sector of WAIS has remained after the Ross and Weddell sectors have collapsed, so maybe that sector isn’t so “soft” either. To avoid ridicule, George and I didn’t use that imagery in LGIS. However, the imagery intrigued me so I replaced “soft” with “weak” and used in in a letter to the editor of the Journal of Glaciology in 1981. Right or wrong, the imagery “took” and the rest is history, as recounted above. Mr Pelto and eric, all very interesting. If I have understood your grounding lines correctly : is there any significance in the ridge in the grounding line which looks to me like a knee waiting to break some sticks for the fire? Yes, ice melting at the grounding line freshens and so lightens the sea-water. The negative slope of the seabed creates a halosiphon (salt-driven) loop, with salty, warmer sea-water replacing cold fresh water from the melt. I think melting also controls the topography. Glaciers push rock, which would explain the hump and negative slope. That big hump probably was the terminal moraine of the glacier for substantial periods, and could be a potential end to the tipping point of runaway grounding line retreat. The University of Texas placed an excellent workshop on line a couple years back “Secrets of the West Antarctic Ice Sheet”. Any plans for another workshop to present these and other findings? There was a paper in Science several years back whose conclusion was that once glaciers left their terminal moraine grounding lines behind, the embayment left behind would freshen and cool with meltwater and provide a negative feedback to more melting. Essentially stopping the runaway process. I’ve looked for it, but no luck. Has this negative feedback hypothesis since been discarded? As long as the media gives voice to these views, I don’t think they should go unanswered–as we see they are not giving up. It’s understandable some are tired of doing so. That’s what graduate students are for, eh? Andy (35) — That does not appear to have happened or be happening to tidewater galciers in southeastern Alaska; those retreat back to the grounding line provided by the upward-inland slopes. #32 and #33 The ridge that the grounding line rests upon is not a moraine. It is several hundred meters high and as can be seen even better in the basal topography map it is not really a ridge but a very broad area of green colored higher terrain that extends beyond the current terminus. There is a trough of blue terrain upstream of the grounding line and another trough of blue beyond the current terminus. This higher subglacial bench is not a weakness, like a knee for a stick, applying torque it is a pinning point buttressing the ice stream. If the glacier retreats off of it, than imagine what may happen. #35 David Benson is correct in referring this idea cited to Alaska. This cannot be plausible in a situation where the basal elevation never reaches sea level. mauri pelto (39) — As a most amateur student of glaciology, I pleased to be found correct by an expert! You wrote “This cannot be plausible in a situation where the basal elevation never reaches sea level.” To clarify, you are referring to PIG where the basal elevatiion is well below sea level? Eric and Mauri, thank you very much for your informative replies. The melting in Greenland is fairly evenly distributed about the perimiter (apart from a couple of stretches), but the most significant thinning zones in Atarctica do appear to be in proximity to the areas where there are known volcanoes. A set of Anarctic volcanoes is viewable on the University of Texas’s GoogleIce. ( http://www.ig.utexas.edu/outreach/googleearth/googleice.html , requires GoogleEarth). From a prima facie inspection of the area, the presence of numerous formations in the ice similar to those made by the identified volcanoes suggests that more volcanoes may exist than have been identified in the region? May I ask whether the type of drainage system known for the Pine Island Glacier? The Magnusson et al 2009 paper indicates that geothermal meltwater will contribute to basal pressure (and so to basal sliding) as long as the drainage system remains a distributed one capable of sustaining the pressure. Once a continuous tunnel flow drainage system forms, basal pressure will drop and glacial motion will decrease. Geothermal heat production may contribute most to glacial movement when it is low enough to keep the pressure within capacity of a distributed drainage system. In the case of the Grímsvötn lake, it can be speculated that had the 1996 eruption not occured, the ice-dam could have held for an indefinite number of years, continuing its contribution to the basal sliding. We also don’t know for how long the dam had been in place for. If I may ask a final question – I remember reading that the increased precipitation in Greenland has caused a downflow of ice from the central highlands, which has increased glacial flow and ice loss through calving. (I can’t remember where I read this, and my immediate search has not found it – I’ll keep looking ). Western Antarctica has mountainous topography, so if the above effect is true, might something like this be contributing to the increased glacier movement? Apologies, in the first sentence to Eric in my previous comment, the phrase “(apart from a couple of stretches)” should be “(apart from a couple of stretches with no thinning)”. That’s staggering. I’ve got nothing to add except my admiration for the people who go out there to do science. We can all imagine what might happen, but we think faster than the processes transpire. Do the changes take decades? 100s of years? 1000s of years? And the first “melting” should of course be “thinning”. I apologise for the poor proof-reading. 26) If it retreats off the grounding line, I suspect it would behave similarly to Columbia glacier in Alaska. That moved of its grounding line in the late seventies, and has been in catastrophic retreat phase ever since. 27) That is quite a different mechanism. Even if this triggering via ice loss mechanism proves to be valid, I doubt there are enough volcanic areas being rapidly deglaciated to cause a global feedback (climate=>volcanics=>climate). The real concern is that the mechanism could create further climate change hazards that hadn’t been appreciated. I know this is a blog for scientist, but does anyone know of any good articles for the layman on climate change? The reason I am asking you guys is because you know the story from the top down, where others do not. I have been thinking overnight : it often happens for me on the subject of global heating. The question relates to increased glacier flow and major ice sheet collapse. If one takes a vertical slice through the horizontal plane of the WAIS then the vertical axis shows depths, from top to bottom, air, ice, water (maybe?) and ground, whilst the horizontal axis shows distance, from ice covered ground to open sea. Through this vertical slice the ground has a profile of peaks and troughs which, translated to the relief for the ice covered terrain and sea, give ridges and valleys where the ice sheet is less or more thick. Vertical and horizontal forces operate on the below sea level grounded ice sheet from tides, ocean currents, thermal expansion and volcanic and other geological (?) activity. The ice sheet moves vertically but not uniformly, even if only slightly, creating stresses somewhere in its mass. The question relates to a major collapse of the sheet sufficient to free many cubic kilometers of ice into the sea where it would melt more rapidly. Where would the fracture most likely take place? On an underwater ridge? Is sufficient known about the relief of the ocean bed to model likely locations for fracturing. I appreciate that one fracture effects the likely appearance of other fractures but I have no feel for this. What would be the likely total of cubic kilometers freed from the sheet itself and how does this translate to SLR and when? Or is fracturing not considered likely in the next 2 hundred years, say, because of the sheer thickness of the sheet at very low temperatures? The two papers don’t mention any velocity changes due to increased slope, but they do record that at elevations above 1500-2000 m, the ice has been growing in thickness by about 5-6cm/yr, whereas below the 1500m level there’s been a thinning of about -2 cm/yr. This would indicate that the slope has increased, and with it the gravitational stress, leading to an enhanced downhill flow of the ice. Jeffrey Davis, I think the point here is that we don’t know the answer to your question yet; hence the intense research focus. However, the observed changes seem to suggest that the answer may turn out to be biased more toward the low end of the range than hitherto thought. This PDF “power-point” by DeConto et al comparing models with the ANDRILL data might be of interest.